This our brand new 3 pieces folding table and chairs suit which includes one square foldable table and two pieces folding chairs. It adopts the durable steel construction, very stable and sturdy . You can place it in your garden, patio or swimming pool side. 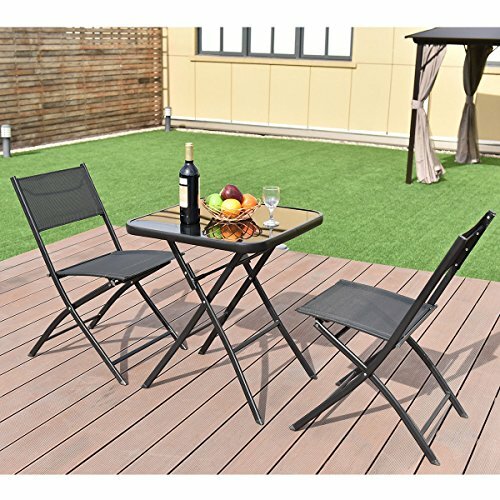 It is very enjoyable to have a breakfast lounging in the morning sun or afternoon tea in the garden with this comfortable and attractive patio set! The glass tabletop is easy to clean and maintain ,and the foldable design is easy to move and storage. If you have any questions about this product by All4you, contact us by completing and submitting the form below. If you are looking for a specif part number, please include it with your message.